This time we would really like to tell you about such a perfect country wedding. 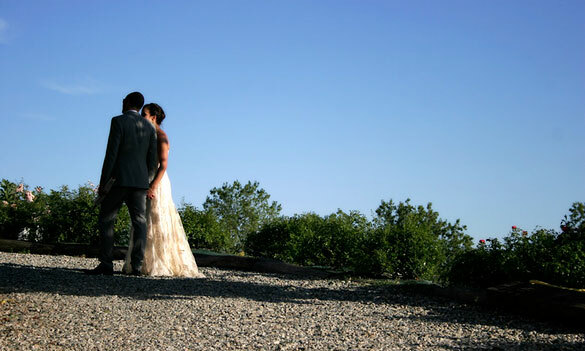 Laura and Mike (for a day Laura and Michele as their guests decided to call them in occasion of their Italian wedding) decided for a country wedding in Monferrato area of Piemonte because they fell in love with this places for its food, wines and amazing vine hills views. Laura has Italian heritage while Mike is South African. They met in London some years ago. They are a lovely simple and friendly couple. 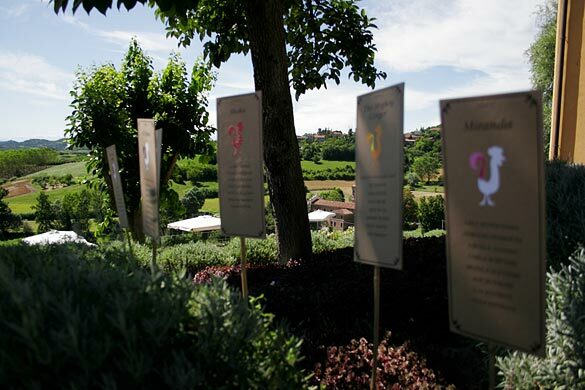 Laura and Mike’s dream was a real country style wedding and for this reason they choose a pretty little Agriturismo in Monferrato area of Piemonte. 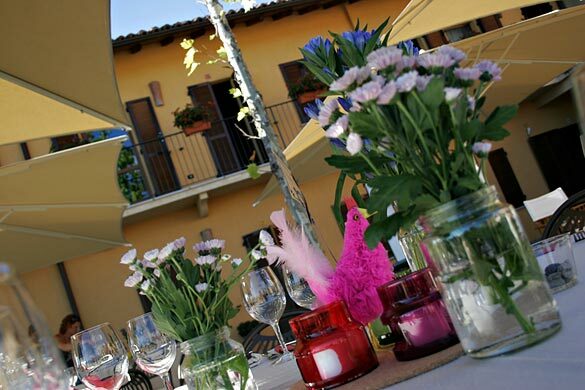 Bride and groom with their close family and friends stayed to the Agriturismo getting ready for the big day. Laura and her bridesmaids had their hair and make up done while the venue was getting ready for the event too. All this a very relaxed and laid down atmosphere. 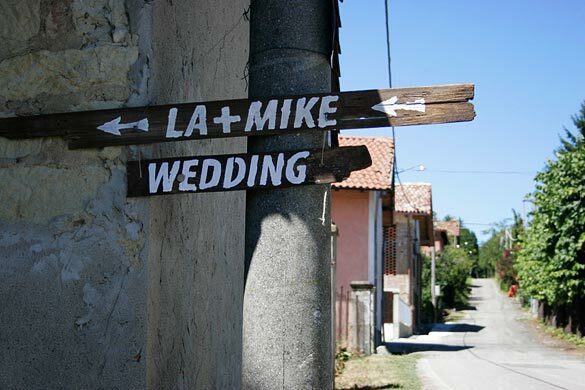 At about 5pm all the other guests arrived following the cute country sign Laura and Mike prepared to welcome them. Mike waited for Laura with all their guests in the lower terrace of the agriturismo facing the vines and the swimming pool. 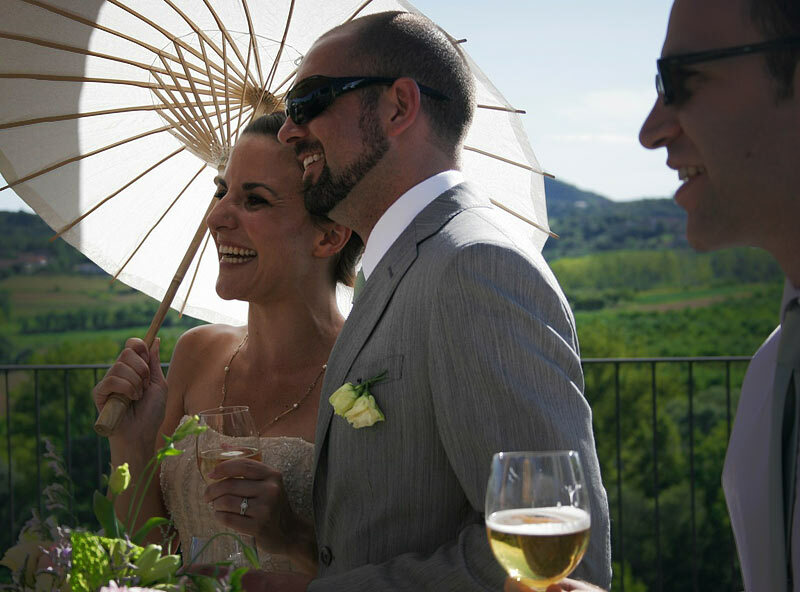 Have a look to Laura’s style, so simple yet elegant with her wonderful dress and lovely parasol. 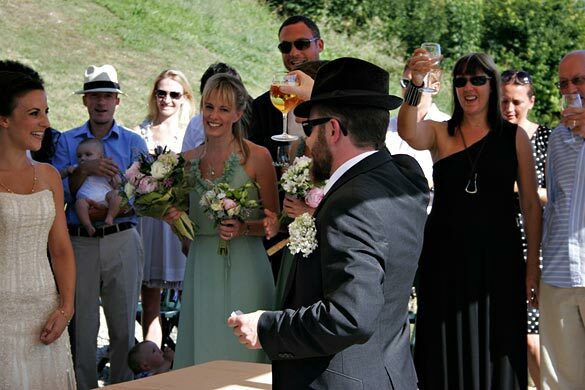 The ceremony was held in the open air of the terrace with a nice aperitif to follow. They all enjoyed a traditional Piemonte aperitif. After this and many pictures with guests all the group reached the upper terrace. The style of the tables arrangements matched the country style Laura had in mind. Simple but surely chic. All stationary details were in brown with little colored details matching candles and lanterns on the tables. Flowers chosen were arranged in jars just to remind the laid down atmosphere of the reception. Dinner was served in traditional Piemonte style. A lot of starter (antipasti), pasta course and Piemonte meat as main course, all this overlooking the perfect view on the hills. Dancing and a lot of fun to end the night. 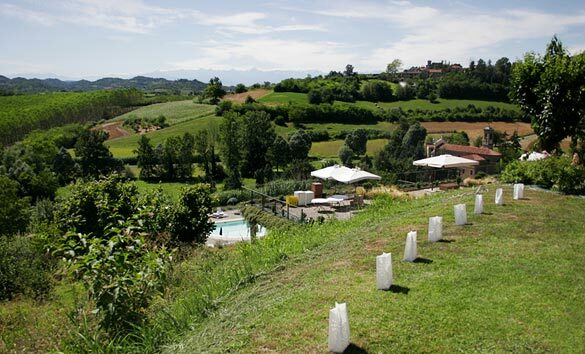 If you are looking for a simple and informal country style wedding keeping the idea of elegance and intimacy, but most of all eating great food and tasting great wines an Agriturismo in Piemont could be the perfect choice. Laura and Mike just loved it and we are sure their guests will never forget such an unusual experience!